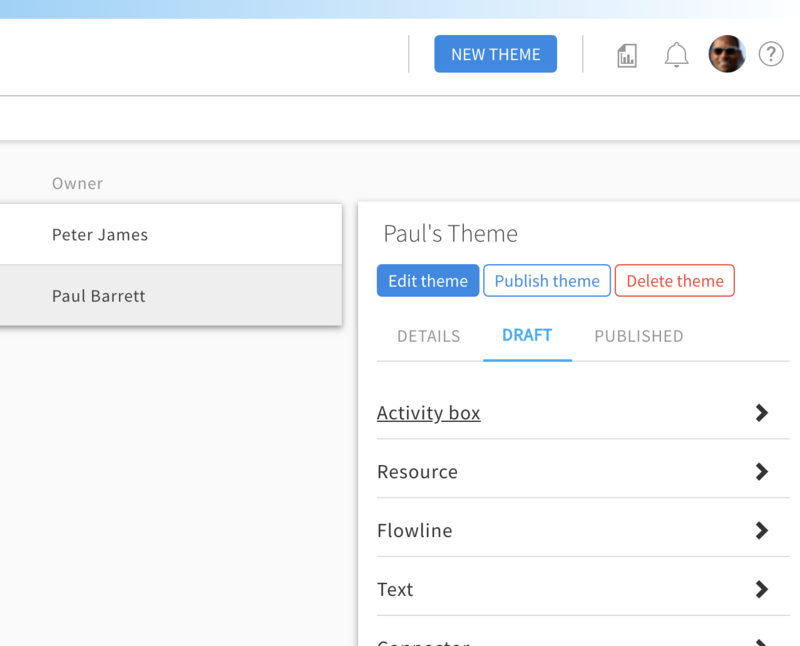 In a Pro Space, a Space Admin can create a theme for each object style. The admin must first publish a theme to make it active. Once published, it can then be selected and applied to any map in the Space by any editor. An editor can also apply a theme to an individual diagram or to a diagram and lower levels. Any object in the selected scope of diagrams that has "Override selected theme" toggled "off" in the right panel will then be changed to the theme you are applying. Clearly, an object that has "Override selected theme" toggled "on" will remain with the proactively selected style settings intact. 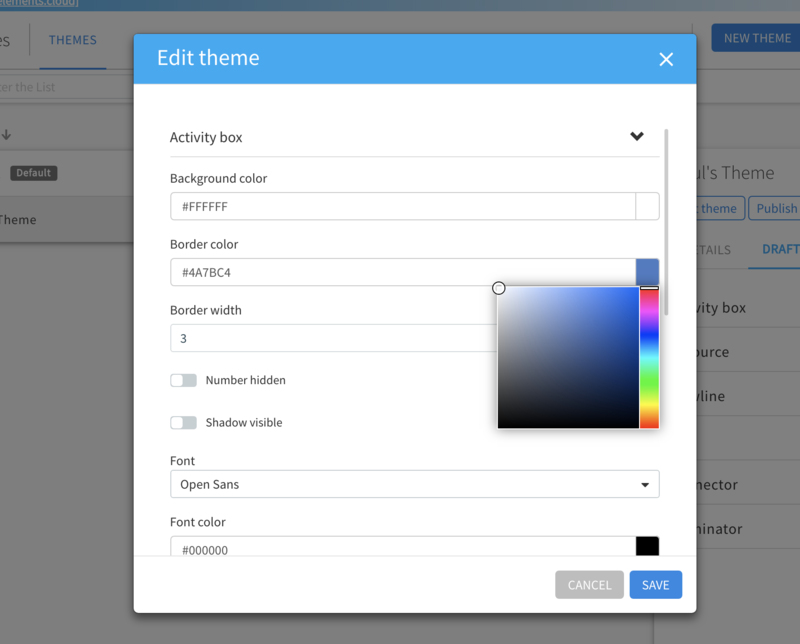 If a theme is edited and these edits are made active by being published, then any diagram with that theme enabled will have its appearance settings changed directly. If open, the new settings will take effect the next time the browser is refreshed. If you click on Spaces in the left Panel, you can see if the Space you want to create and apply themes to is a Pro Space by selecting the space, as it has a green PRO label as below. 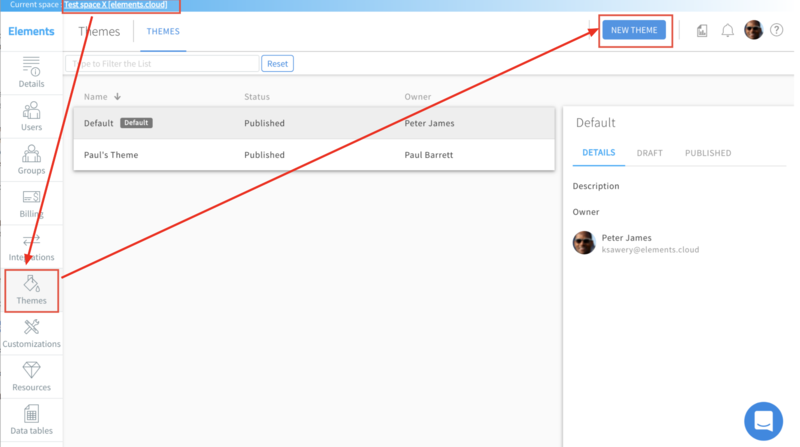 Assuming that is the case, and that you have Space Admin when you click on the blue Manage space button in the right panel, you will see the Themes button on the left panel. Once you are in the Themes window, you click the New Theme button in the upper right screen. 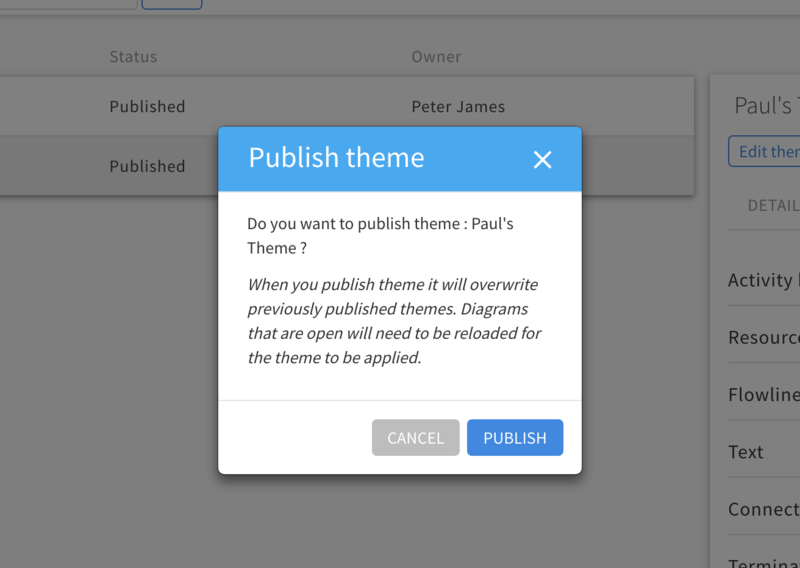 and then enter a name, description and select an existing theme to base your new theme on. Typically, clients create a standard theme based on the corporate color palette, and then create variations on this theme to apply for certain situations. 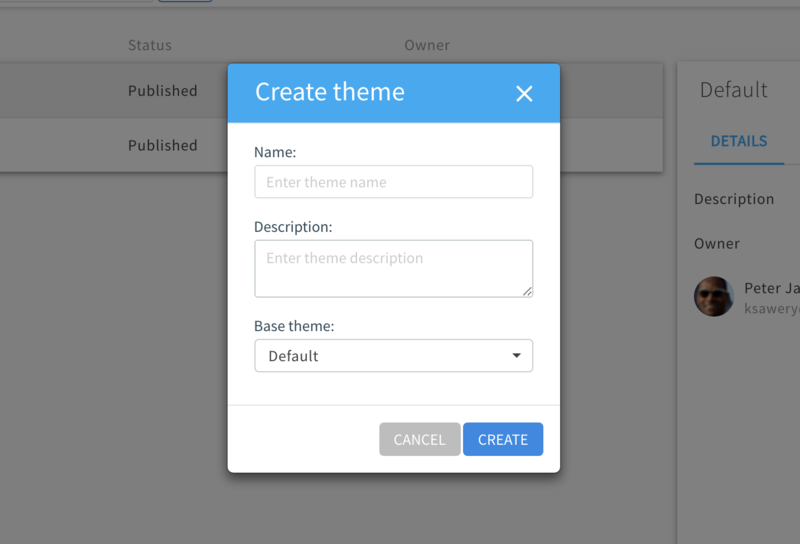 Once you create the theme, it exists in the list, but you now need to click on "Edit" to set up the specific objects across the theme. If you look at the top of the window, once the theme is selected, if you have Space Admin rights, you can then click on EDIT. Note: once you have edited the theme, you will need to click on PUBLISH to make it visible and usable by editors on their diagrams in the Space. Useful tip 1: you can pick colors from the color chart, but if you have specific colors you are looking to match, you can manually enter the hex code for the color. If you only have the RGB numbers, you can convert using any number of free utilities and browser extensions to ‘convert RGB to Hex’, or use a free color pipette/color dropper to pick up the hex of a given onscreen color. Once again, remember that once you have edited the theme, you will need to click on PUBLISH to make it visible and usable to editors in the Space. When you do, you will get a warning that it will overwrite this published theme everywhere it has been used, to make sure that is your intention. Once themes have been created and published by Space Admins then any editor can use themes when creating a new map, applying to their current diagram, or to current diagram and lower levels. In a Pro Space, the diagram details (right panel) show the currently selected "diagram theme". If you haven’t applied a theme before, it will be "default". Click on the dropdown and select a new theme, and the settings for colors and styles of that object will be applied as the "current theme" to the selected scope of the diagrams. It will overwrite the format of any object that has not been explicitly set to “Override selected theme” in the right panel. You can have any number of themes. If you want to find out who can set up a theme for you, the Space Management app contains a list of people who have Space Admin rights who can setup the Themes for you.